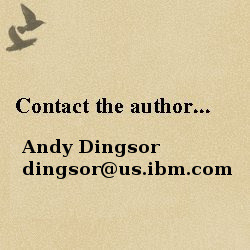 - Are you attending the IBM Impact 2011 conference? - Do you use wsadminlib? - Would you like to give a brief presentation with me? I have proposed a session on wsadminlib to the Impact committee. I proposed introducing wsadminlib and explaining how to use it. If the session is accepted, I would like to recruit a wsadminlib user to speak along with me, to give a brief perspective and testimonial. There are some perks for speakers too.